Victor started his career as a deck hand on a sport fishing boat in 1985. Very mechanical, he was responsible for maintaining the vessel's mains, hydraulics, pumps, water makers and so on. By the time he was 20, he had earned his 100-ton masters captain license. In 1995, he left the sport-fishing world for a job as a warehouseman with a HVAC and plumbing manufacturer's rep company in Phoenix. He quickly found himself working with engineers and contractors designing and selling HVAC and plumbing systems. In 1999 he started his own manufacturer's rep firm, Mechanical Room, Inc. 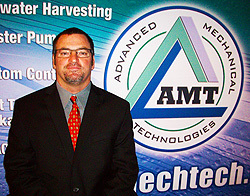 In 2007, he started his own flagship company, Advanced Mechanical Technologies which now manufacturers the best packaged HVAC and plumbing systems in the world.